We were gratified to help to guide and interpret the goals of the clients and design a kitchen that was right for them. This kitchen and dining room remodel required the removal of unfashionable design elements including an above the cabinet soffit, an unnecessary railing that divided the kitchen and family room and outdated vinyl and carpet. We also replaced all of the windows in the house with Andersen 400 series casement windows. The clients wanted the cabinets to run all the way to the ceiling, but they did not want the standard solution of simply turning 30-inch cabinets into 42-inch cabinets for a tall vertical look. Instead, they wanted 12-inch of cabinets along the ceiling, below the standard 30-inch cabinets. This design creates a stunning and distinct look that provides a horizontal line around the perimeter of the room. 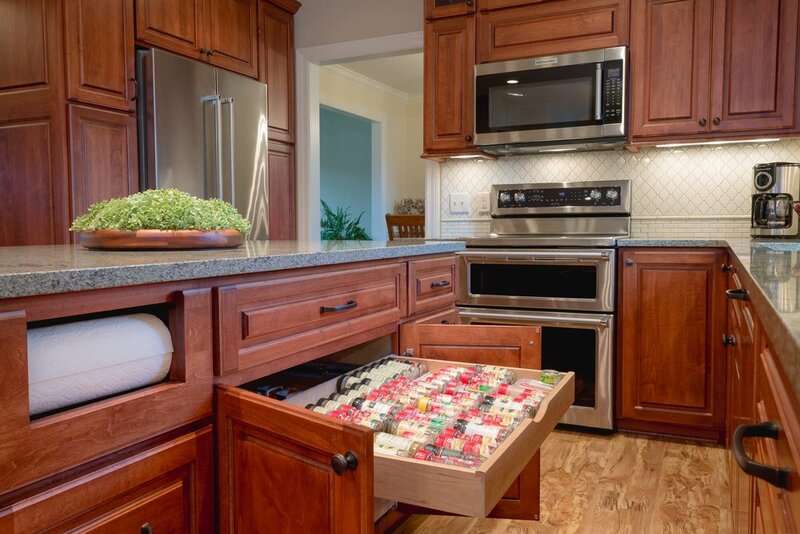 Three custom elements are built into the island: A lighted herb-growing cabinet, an accessible paper towel holder, and spice drawer. At the desk, the printer and paper shredder are hidden in a door designed symmetrically to the file drawers on the opposite side. On the main level of the home, all of the woodwork and interior doors were replaced with a tall 5-inch Colonial baseboard and a wide, 3-inch window casing to create a substantial elegance. Wainscot was installed in the dining room giving it a sense of grandeur and formality. We are proud to report that this project won the 2017 NARI Madison CotY award for a Residential Kitchen Remodeling from $60K to $100K.